Interested in hosting your own ACA sanctioned event? Moving forward only active ACA club events will be sanctioned as point’s events so get your clubs signed up today! Make sure you have the insurance coverage and benefits that your club needs by joining the ACA with a low cost membership AND save money doing it! 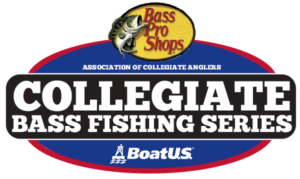 Here is how it works: Simply register your College fishing club with the ACA with at least 6 member (or more) in The Bass Federation’s ACA club roster management system. You can follow the link below to register the club and add your members for the cost of only $40.00 per member. Your ACA membership also comes with full TBF national membership and a full year of FLW Outdoors competitor membership! This not only gives your club and your anglers’ unparalleled insurance coverage but it also provides one-stop shopping and allows you to fish all the best in fishing! Active paid ACA members are paid up and eligible to join their home state federation and fish their local qualifiers all the way to the TBF Adult National Championship. Or if both members of the winning team at the Boat US Collegiate National Championship are active ACA members they go directly to the TBF National Championship! You or a member of your club could actually fish their way through TBF directly to the Forrest Wood Cup by having this membership and winning. OF course with your FLW membership you can also fish the FLW college events or the BFL’s and more! The possibilities are endless with ACA and your membership saves you money! Only Active ACA club events will be sanctioned as point’s events. Full TBF, ACA AND FLW membership for only $40. Opportunity to compete in ACA, TBF and FLW tournaments with many opportunities to advance! Insure your School Run Tournament by having your club be an ACA Club. This policy covers the Club, its officers and members in case of an claim during an event that you sanction with your ACA club and run. Insurance Coverage Highlights $1,000,000 GL for ACA club events, comprehensive liability Insurance, $25,000 in excess medical coverage, $10,000 in AD&D event coverage and more. Check out the Insurance FAQ on the website! Get involved with TBF youth programs including “Reel Kids Casting” events and “Student Angler Federation”, which is designed to get students in high schools involved in school fishing clubs. Get involved by hosting your own conservation projects. Looking for a place to fish after college? Join the largest and oldest grassroots fishing organization in the country. TBF has over 2000 clubs located in 46 States and Canada that provide many opportunities to continue fishing competitively.